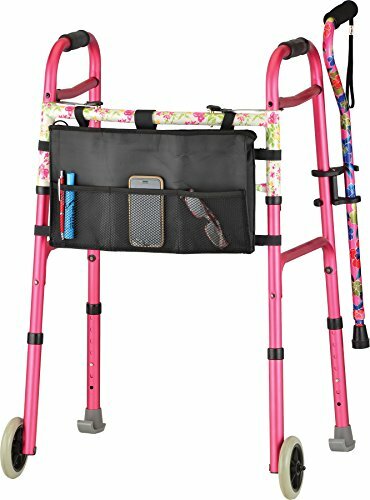 Designer folding walker in pink with cane and accessories. Folding walker has dual-button release provides greater security. Folds to 4" width for easy transport and storage. Height Adjustment: 32.25" - 38.25" (approximate user height: 5'4" - 6'2"); Width between arms: 17"; Overall width: 22.5"-25.75"; Folding Width: 4"
4001BK - Folding walker bag attaches securely to the front of the walker. Has three front mesh pockets ideal for holding personal belongings. Dimensions: 15.5"L x 13" W x 3" D; 40027GR - Attaches easily to the folding walker (no tools) Glides easily over different surfaces and door jams. No more tennis balls!